My grandfather was a railway man for years. It left him with a lifelong love of the railway. 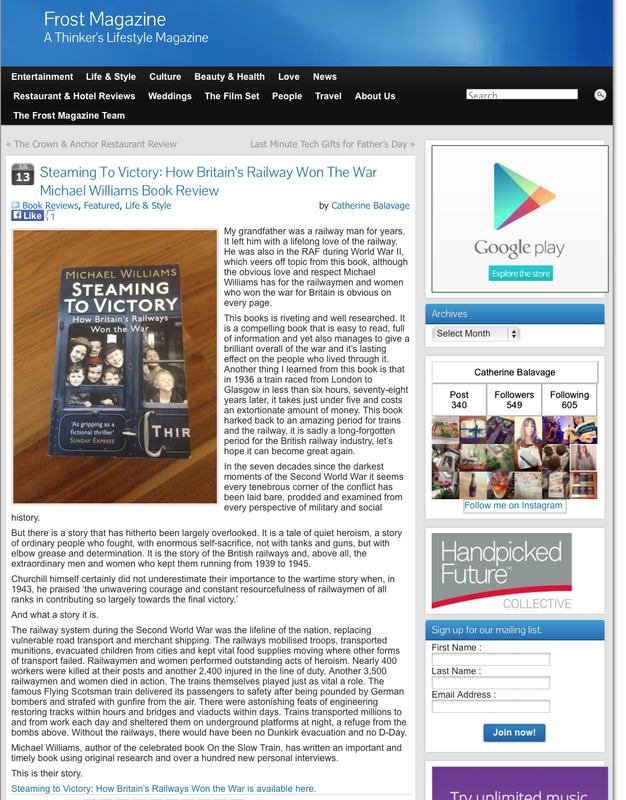 He was also in the RAF during World War II, which veers off topic from this book, although the obvious love and respect Michael Williams has for the railwaymen and women who won the war for Britain is obvious on every page. This books is riveting and well researched. It is a compelling book that is easy to read, full of information and yet also manages to give a brilliant overall of the war and it’s lasting effect on the people who lived through it. Another thing I learned from this book is that in 1936 a train raced from London to Glasgow in less than six hours, seventy-eight years later, it takes just under five and costs an extortionate amount of money. This book harked back to an amazing period for trains and the railway, it is sadly a long-forgotten period for the British railway industry, let’s hope it can become great again. In the seven decades since the darkest moments of the Second World War it seems every tenebrous corner of the conflict has been laid bare, prodded and examined from every perspective of military and social history. But there is a story that has hitherto been largely overlooked. It is a tale of quiet heroism, a story of ordinary people who fought, with enormous self-sacrifice, not with tanks and guns, but with elbow grease and determination. It is the story of the British railways and, above all, the extraordinary men and women who kept them running from 1939 to 1945. The railway system during the Second World War was the lifeline of the nation, replacing vulnerable road transport and merchant shipping. The railways mobilised troops, transported munitions, evacuated children from cities and kept vital food supplies moving where other forms of transport failed. Railwaymen and women performed outstanding acts of heroism. Nearly 400 workers were killed at their posts and another 2,400 injured in the line of duty. Another 3,500 railwaymen and women died in action. The trains themselves played just as vital a role. The famous Flying Scotsman train delivered its passengers to safety after being pounded by German bombers and strafed with gunfire from the air. There were astonishing feats of engineering restoring tracks within hours and bridges and viaducts within days. Trains transported millions to and from work each day and sheltered them on underground platforms at night, a refuge from the bombs above. Without the railways, there would have been no Dunkirk evacuation and no D-Day. Michael Williams, author of the celebrated book On the Slow Train, has written an important and timely book using original research and over a hundred new personal interviews.